When you’re planning a night out on the town or a celebration with friends, travel in style. 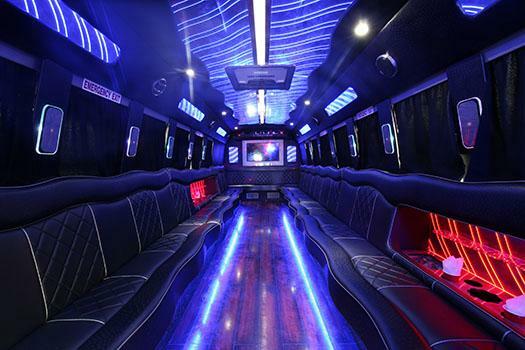 A party bus is essentially a charter bus complete with a wet bar, dance floor, stripper pole, lights, sound system, and side-facing seats for the ultimate experience as you hop from one location to the next. Along with the experience inside the bus, renting a party bus comes with a few benefits you won’t get with other forms of transportation. A party bus in Las Vegas can fit up to 34 people, which means once the party starts, it doesn’t have to stop if you’re going to more than one location. Everyone can drink, dance, and have a good time in your own personal club-on-wheels. In most cases, the more people you bring, the greater the chance that something will go wrong. And let’s face it–we all have that one friend who can never find his or her way around. When you rent a party bus in Las Vegas, it will pick everyone up at the same place at the same time. Everyone will stay together and arrive together without the worry of someone getting lost or arriving after the group has gone into the club. We assume you’re taking cabs around the strip. But if you rented a car (and think, for some reason, you might offer to play DD), we want to be the first to tell you that with a party bus there is no need to sacrifice your night of fun. Partygoers never need to worry about having too much to drink to drive safely. More importantly, you won’t be that person who goes home and tells the exciting story about that one time you stayed sober in Vegas. The more people in your party, the greater the value of a party bus rental. Aside from the fact that you can party on the bus, by renting a single vehicle, everyone can avoid the expense of multiple cabs or the frustration and cost of parking in a city you’re not be familiar with. A party bus comes with a courteous professional driver who will ensure your entire party arrives safely to your destination(s). There is no need for anyone to get pulled over or risk an accident after a night of drinking and dancing. You came to Vegas to have fun, we want to make sure it stays that way. Whether you’re planning a night of club hopping with friends or you want to let loose at a divorce party (yeah, those happen), there is no better way to travel in style than taking a luxurious party bus with all of your friends. Check out our upcoming Las Vegas pub crawl or give us a call at (702) 843-0525 to learn more about our private tours!